This is the first eye makeup post in the history of Wonderlusting! I’m a Lipstick Lover and when I wear eye makeup I rarely venture beyond a slick of black liquid eyeliner. I recently did my first, guess I can call, “face of the day” using natural and organic beauty brands to create festive looks for day and night. 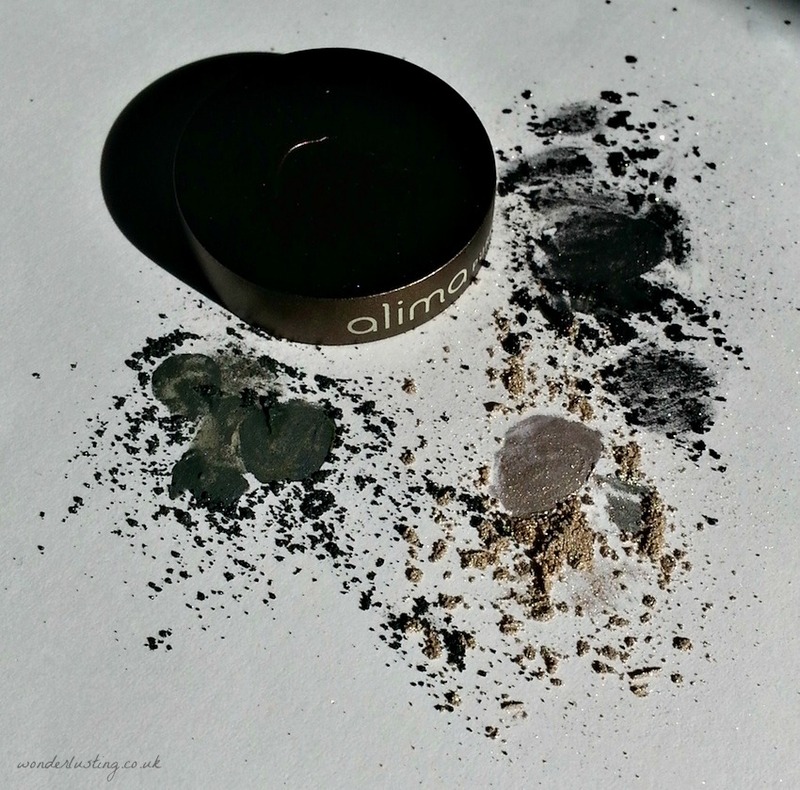 The stars of the daytime look were the Alima Pure pearluster eyeshadows so I thought I’d give you a closer look at the products. 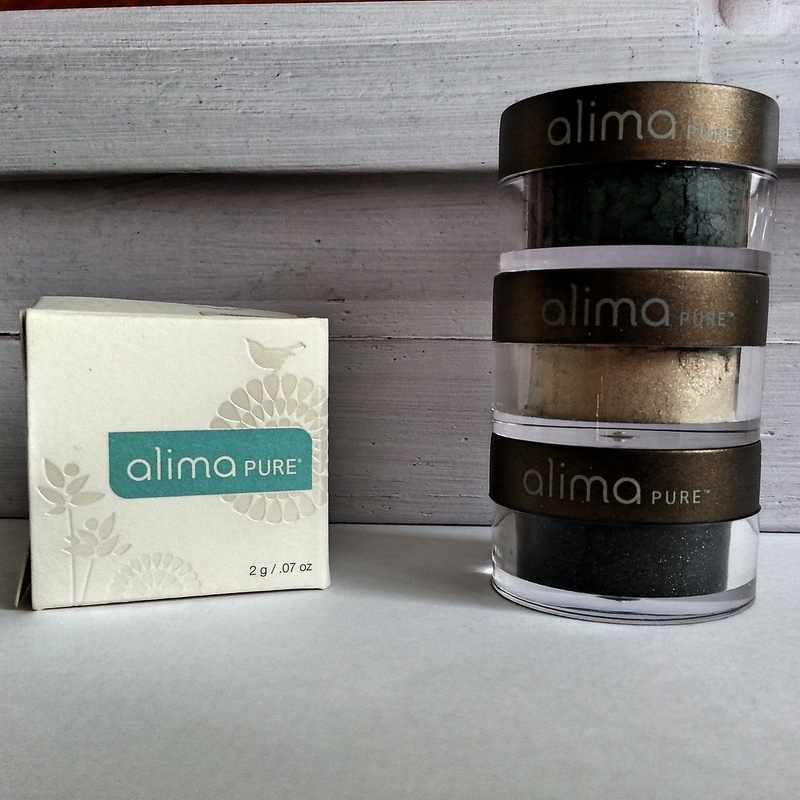 Alima Pure is a mineral makeup company that makes natural beauty products from high-grade minerals without preservatives, parabens, or dyes. The ingredients lists are nice and short with just a handful of items. 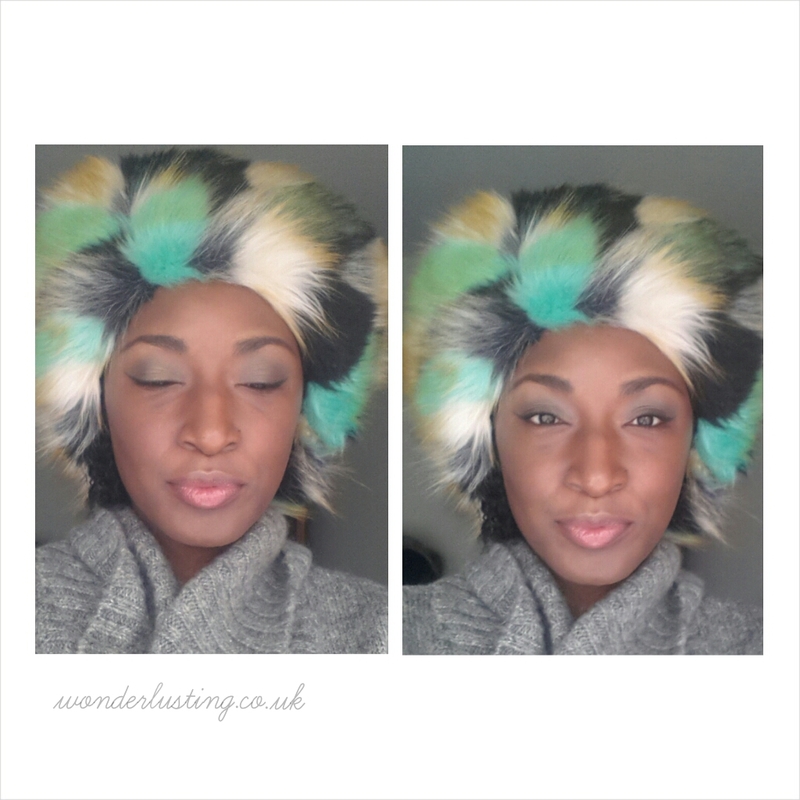 The three colours I used are from Alima’s ‘Decadent Fall’ limited edition collection. Alima say the collection is inspired by film noir, though to me there’s something sophisticated 70’s chic about the metallic colours. The texture of the eyeshadows are very silky and they have an iridescence rather than being frosty shimmer. I love the versatility of the powders. Dab on with your fingers for a sheer wash of colour, use a brush for more of a pigment punch and when wet the colours intensify to their full metallic magic. Breathless is the one colour that I prefer dry as when wet it pulls slightly too white gold for my colouring. It does work well as a highlighter when brushed on dry with a light hand. 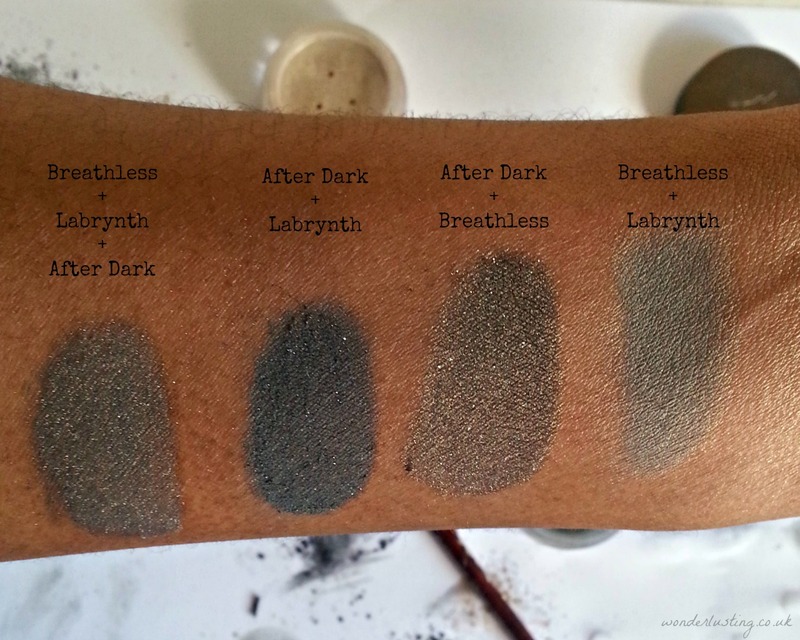 I love that you can tailor make your own colours by mixing the different eyeshadows. I noticed that the kind of brush you use makes a big difference with these mineral powders. For the best results I like to apply with my fingers or to use the Alima #36 crease brush – they say it’s for the inner and outer eye, but it’s perfect for use all over the eye area on me. 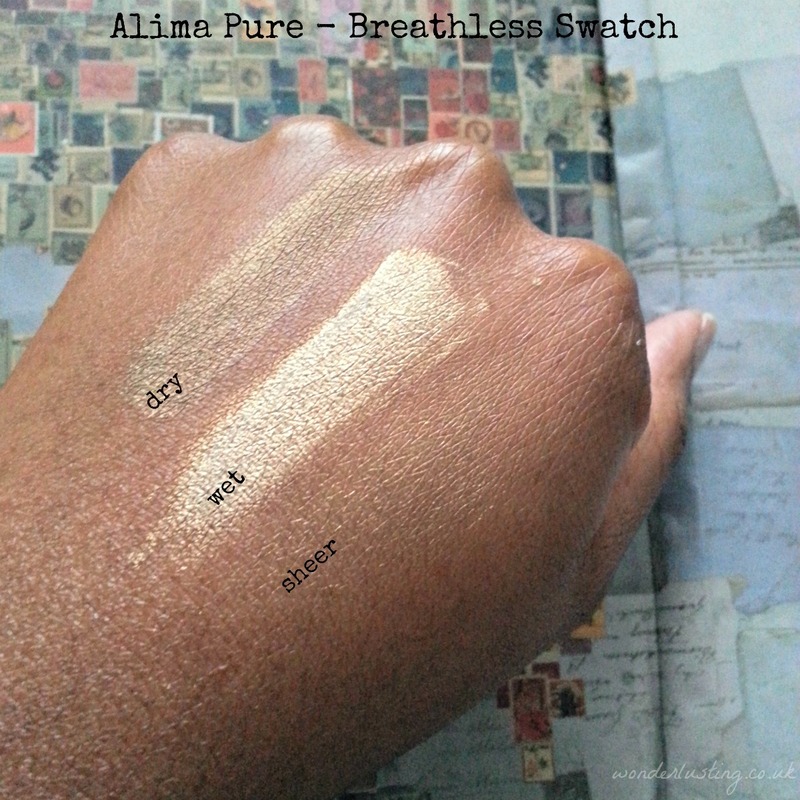 The Alima pearluster eyeshadows can easily be removed with water or just by wiping. The downside is that they are not very long lasting and the colours lose their intensity unless you use a primer. For a daytime look or dinner I don’t mind but these would not survive a Studio 54 style night out. Though to be fair I doubt much would. Now I’ve discovered I can do eyeshadow I plan to have more of a play. I loved the multidimensional colours and texture of these eyeshadows and will certainly be exploring more of the Alima Pure range. I just made a purchase for their foundation that was shipped out today. And took a look at these exact eyeshadows. The pigmentation is stunning. Labrynth especially looks gorgeous. They are gorgeous. I’m planning on checking out the foundations though I’m a little scared of powder on my dry skin. Do you recommend? I loved how you looked wearing them for your Signature Looks tag, but now, as a close-up swatches, I must say they are even better than I thought, very intense, and multidimensional. ‘Breathless’ is da bomb! P.S. On me, eyeshadow and no primer usually means disaster. However, I found that a wet application (with a flat, square, firm brush) lasts much longer and better, but it really depends on each individual colour. Thanks for the tip – I’m just getting used to the powders and brushes really seem to make a difference. I now want to find a copper to mix Breathless with. Really are gorgeous colours. Thank you! The colours really are gorgeous.